Tampa Podiatrist Asks: Can the Eagles Soar with Jason Peter’s Achilles Injury? 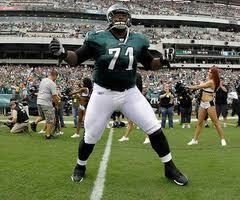 Jason Peters isn’t soaring these days even though he is an Eagle! With his recent Achilles tendon injury and surgery, he may be out for the entire 2012 season. So what does this mean for the Philadelphia Eagles? Well, losing one of the best tackles in the NFL is certainly not something that a team can replace. This essentially places their offensive line in a bad position, literally. So what is so terrible about an Achilles injury? It is one of the most dreaded injuries in sports because it often requires surgery and a long rehabilitation. Some athletes never quite recover fully from the injury. However, this injury is not limited to professional athletes. Recreational runners, baseball and basketball players often suffer the same injuries. Even the casual work out can lead to this very same injury. Subtle warning signs are often missed. The warning signs are typically pain along the back of the heel with Achilles tenderness in the morning and with activity. In some cases there may be associated swelling that does not seem to resolve. The back of the Achilles may feel swollen and irregular. This is typically called Achilles tendonitis. Treatments may include stretching, physical therapy, heel lifts and anti-inflammatory medication. In more advanced cases, EPAT or shockwave therapy and MR4 laser may be an excellent option along with custom fit orthotic devices or arch supports. Heed those warning signs. The sooner you get treatment, the quicker you can return to your activities. Don’t end up like Jason Peters with a torn Achilles tendon! If you suffer from foot, heel or Achilles pain, call Dr. Marc Katz in Tampa for an immediate appointment.